Posted in: Utility. Tagged: cat, kitty list, to do list, utility. Chores are boring! Make tasks more fun by calling them Kitties! 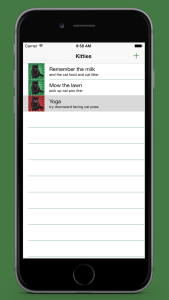 Use this simple to do list to schedule all your errands. Achieve your goals and progress through your projects effortlessly. Good habits start with being organized. Though don’t forget to give priority to your cute kitten! As soon as you fire up Kitty List you get a quick view of the tasks you need to complete. 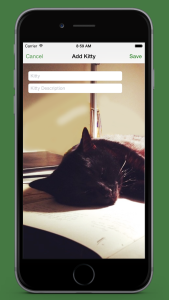 Add a new Kitty by touching the + then use Save to add it to your list. 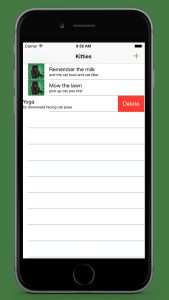 When a task is done simply swipe to delete.